Note: The first section of the lyrics is spoken, and does not appear in the lyrics booklet. The figure of you is reflecting in the water's surface like a mirror. Your next meet was an easy race. turned your head round, and gave me a kind smile. Please stay a little longer. I concealed my emotions by stealth. I can never stare at you. Therefore I want to approach you. I can never step into you. It goes without saying anymore. That place where I longed for adds to brightness. I see our distance is far so much. reflect me in your eyes sometimes. 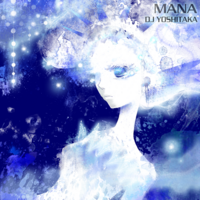 MANA is one of the unlockable songs of Phase 4 of pop'n music 20 fantasia's Soreyuke! pop'n quest (それゆけ！ポップンクエスト) event. It could be unlocked from May 23rd, 2012. Much like SHION, MANA's character has the same name as the song title. MANA is ERi's first song in pop'n music since pop'n music 14 FEVER! 's High School Love. MANA is the first pop'n music song to receive voiced commentary, as opposed to a traditional paragraph (or longer) comment on the official site like new pop'n music songs typically do. DJ YOSHITAKA and PON provide the 2:25 long commentary, during which the entire song plays (it actually loops due to the length of the commentary). A 3P palette for MANA is available for inputting the code found at the back of the pop'n music card PG20R010/016. The code must be inputted at the final e-AMUSEMENT screen, where your already unlocked Secret Characters are shown. MANA's 3P palette was later used for Evans. From pop'n music éclale onwards, this 3P palette is available by default. MANA is the sixth unlockable song of the Pastel Adventure colette Mountain 1 event of REFLEC BEAT colette -Winter-. From REFLEC BEAT groovin'!! to REFLEC BEAT VOLZZA 2, MANA was playable by default. After being removed from the initial release of REFLEC BEAT 悠久のリフレシア, MANA was revived on June 21st, 2018.
pop'n music difficulty rated from 1 to 43 through pop'n music 20 fantasia, and 1 to 50 from Sunny Park onwards. REFLEC BEAT to groovin'!! Upper difficulty rated from 1 to 10+, 1 to 13 in VOLZZA/VOLZZA 2, and 1 to 15 in 悠久のリフレシア. This page was last edited on 18 April 2019, at 04:32.